Changed all the pages to php and changed the contact form on the Contact page to a newer version. All adverts removed from this site, deleted some old broken links from the Links page, changed the style of the site to my newest version of my style sheet (CSS). One link added to the Links section. Changed the site layout with some new techniques I have learnt, the project has not been cancelled, it's just been put off until next year. 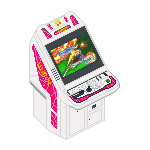 New GSRcade logo added to the site. (at the time) and I would not recommend it. to buy and can also be used on an actual PlayStation or PS2. Added some images for the previous versions of my Joysticks, I'm planning on updating the Jefcade joystick so I can play my Gradius IV Fukkatsu board. Updated some of my CAD drawing with some of the new information I have got from the working prototype. Flexible screw driver attachment finally turned up, it works very well for screwing in the lid screws instead of using a stubby screw driver. I've made yet another metal template for the lid fixings, the projects slowed down for the minute as other things have become more important at the moment but hopefully I will have a rough prototype ready in the next few weeks. No the project is not dead, it's just I have been waiting for two weeks now for a flexible screw driver attachment for my drill as some of the screws that hold the lid on cannot be done up. Messing around with TurboCAD LE again, updated all my design sheets and also grabbed some images of the GSRcade. I think its starting to come together quite nicely. The three templates are complete and I have drilled the holes in the main MDF box panels (I will leave the top till next week as it is a lot of work). When screwing the box together some of the MDF panels split at the edges even though I had drilled a small pilot hole (with clearance holes on the side panels). I'm also not very happy with the finish of the MDF because of the way the material rips and tears quite easy (even when countersinking the holes), I will have to look for an alternative wood for making the main box (probably leave the main top as MDF though). The three looms have been made (Joystick, Buttons and Ground) and I've made a metal template for marking out the holes (for the buttons) & Joystick. I've made the choice of wire to use (16 strand 0.2mm) and which colour's to use. I was originally just going to use just one colour for the ground (Black) and one colour for the other connections (Red) but this would make fault finding difficult, so I'm now using seven colour's (including the Black ground lead). Ordered some more Router cutters for putting on a radius edge instead of a T-Moulding as this should still look professional and not make as much MDF mess. Also ordered a 30mm Forstner Bit for machining the 30mm holes (30mm now instead of 29mm as they don't make a 29mm Forstner Bit), the Flat bit wood drill has some breakout problems with MDF, the Forstner Bit should cure that. I tried varnishing the top but it did not come out as good as I thought it should, I may just use clear lacquer next just to see how that works out. Next week I will be making a metal hole template for the eleven 30mm holes as the plastic one has some holes on the wrong place and a metal one would last longer also. Tried out the new router bits this morning on piece of scrap MDF and they cut very well, I will be trying it on the actual arcade top this afternoon. Steve at work helped me (as he has many times before) by making a template for the top of the controller out of 6mm plastic. This weekend I should be able to start routing out the joystick recess and the four radius corners of the top section (only if the routing bit and flat drill bits turn up that is). The holesaw was not so good at drilling the 29mm holes for the Buttons as the teeth quickly clog up and you have to keep cleaning the teeth, you also get a poor cut hole. I had a 20mm flatbit wood drill and that was much better so I have ordered some 29mm ones online (most places only sell 25mm then 32mm but no 29mm). Well I've got my first Router and I must say it's actually a lot easier than I thought it would be, this will make recessing the Joysticks and cutting the T-Moulding much easier. I will be making a cutting guide so I can cut some rounded corners on the main section. I'm getting used to TurboCAD LE now so the main layout coming along very nicely, I even modeled the Joystick and a Button so I could get the correct dimensions for the wood, this was much easier and quicker than the method I used before which was a cardboard model and a 300mm rule. The Screwfix order turned up today but was missing the 6mm Coach Bolts (used to hold the joystick in place), I have email them for a replacement. The Joystick and lots of Buttons turned up today, I'm quite happy with the 8-Way Happ Ultimate Joystick I ordered. I also have the top panel ready to be machined. Screwfix items have been order and should turn up to tomorrow. Button layout more or less finished in TurboCAD, now I just have to sort out the height of the box (depends where the buttons and Joystick go). Designing the button layout in TurboCAD LE v4.1, you can download and use it for free non commercial use, well worth it as it's a very good CAD package, I've used Autocad and IDEAS but the latest versions of these programs are quite complex to use and centre more on 3D work. I've decided to use 18mm MDF in the construction of the main box because the wood (if you can call it that) is strong and of consistent quality. Ordered the buttons and joystick yesterday, they should be with me by midweek. I will be making a prototype lid out of MDF with all the holes on the next week or so (I already have a cardboard prototype), then I can work out the size of the box that goes underneath. Materials planning and manufacturing methods researched, choice of either metal or wood for the main box construction. Steering wheel is on order (I pick it up tomorrow morning). Site opened and domain name registered.